Richard Lewis (1789-1867) was a merchant. 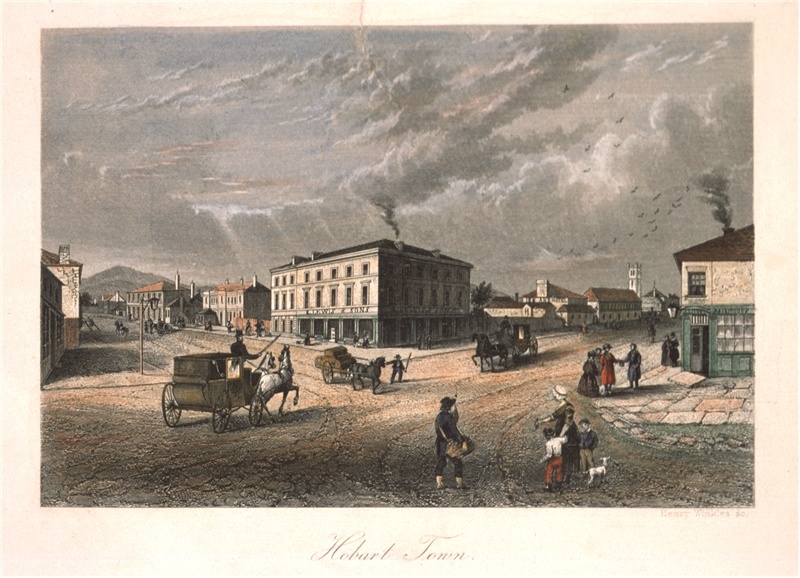 As the fourth son of a vicar, he probably always knew that he would have to make his own way in the world, and in 1815 he arrived in Hobart Town. 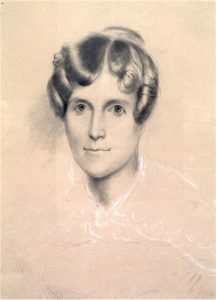 In 1816 he married Isabella, the daughter of Captain Neil MacKellar of the New South Wales Corps and Sarah Cooley, his convict mistress. In the same year, Lewis was appointed as the government appraiser and auctioneer, and became a prominent member of the merchant class. In 1823 he was one of the founders of the Bank of Van Diemen’s Land. Around the same time (and on the other side of the world) in Birmingham, Thomas Bock was forging a career as an artist and engraver. He might have led a fairly unremarkable life if it weren’t for his crime – trying to induce a miscarriage in his teenage mistress, Ann Yates. For this crime, he was sentenced to 14 years transportation, and arrived in Hobart town on the Asia in January 1824. Bock’s skills as an artist were useful to the new colony and he was immediately employed as an engraver. One of his first tasks was engraving the banknotes for the Bank of Van Diemen’s Land. He also made post-mortem sketches of the notorious convict cannibal, Alexander Pearce (for ‘scientific interest’) and worked for the Deputy Surveyor, George William Evans. Richard Lewis clearly approved of the convict’s work for his bank. 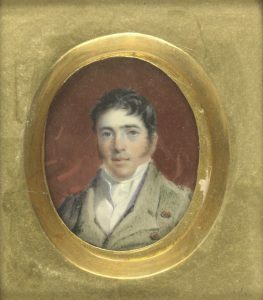 Soon after Bock engraved the banknotes for the Bank of Van Diemen’s Land, Lewis had Bock paint miniature portraits of himself and his wife, Isabella. The colony’s principal frame-maker, Robin Vaughan Hood, made a pair of elaborate (and very expensive) gilt frames for this miniature and its partner. Richard Lewis would have been about 36 when he first sat for Thomas Bock. 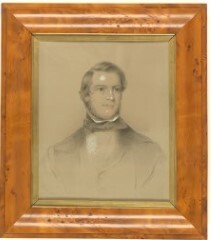 The portrait was done in watercolour on ivory and shows a fashionably dressed, dignified young man with tidy sideburns, somewhat tousled hair and striking blue eyes. 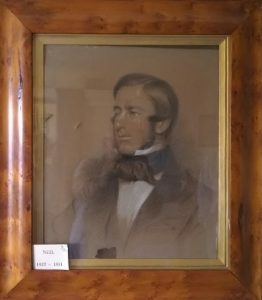 This last feature seems to have been a bit of an exaggeration – the artist may have been flattering the client’s vanity, or struggled to capture this subtlety when working in miniature, or with watercolours. Bock would create a different effect when he drew the man again. Two copies of Isabella’s miniature were made, and the second was mounted in a Japanned frame – much more portable than the ornate gilded frame. Perhaps Lewis was so happy with the one he had at home that he had a copy painted to keep in his office? Both images show the demurely dressed 27 year old wife and mother of three with pale skin, dark hair and brown eyes. The copy shows a bit more life, with more colour in her cheeks, a little more of a smile and lighter hair. Isabella was kept busy bearing eleven children (although only seven births appear in the birth registrations for Van Diemen’s Land). 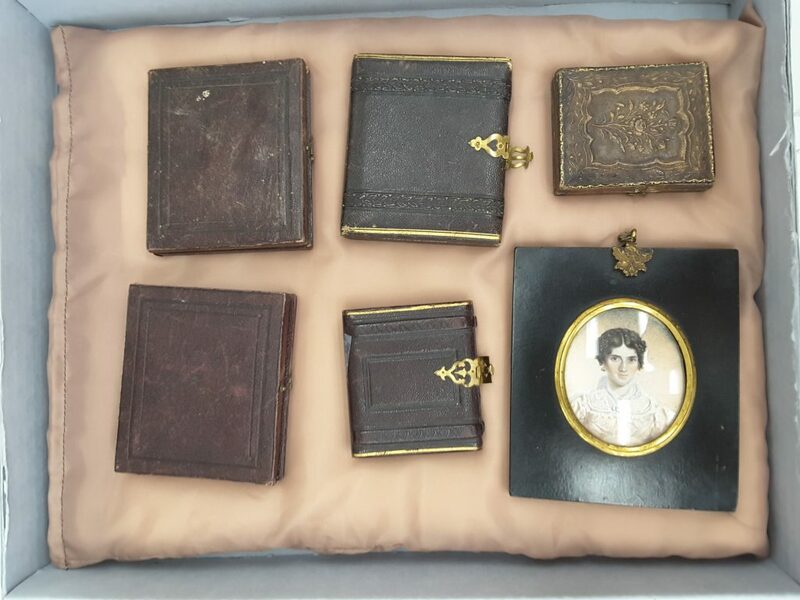 Cases containing daguerreotype photographic portraits of Richard and Isabella’s sons, duplicate miniature portrait of Isabella in watercolours on ivory in japanned black frame. From 1831, Bock had a gallery in Liverpool Street, and gave lessons in painting. He was granted a conditional pardon in 1832, freeing him to become the colony’s society portrait painter. Bock worked in oils, watercolours and crayons, but the crayon drawings are his most compelling. He was an early experimenter in photography using the new and expensive method of Daguerreotypes , accessible to only the wealthiest clients. As his fame and clientele grew, Bock continued to paint portraits of the wealthy Lewis family. He painted Mr and Mrs Lewis again in 1835, this time in a pair of grand oil paintings. In preparation Thomas Bock sketched Isabella with a determined mouth and glossy hair, capturing her personality before creating the more formal oil painting. The Allport acquired this sketch many years ago, and as is usual for Thomas Bock, the sitter wasn’t named – but now we can be certain that it is indeed Isabella. 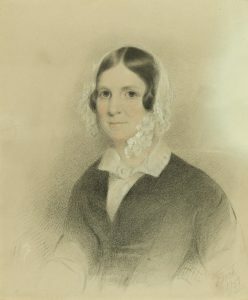 Portrait of Isabella Lewis, attributed to Thomas Bock, 1793-1855. ALMFA, TAHO. In 1845 Richard Lewis, Esquire made a dramatic announcement in the Colonial Times about the construction of his new store, on the corner of Collins and Argyle Streets. The building still stands today, presently home to a sports store. The Lewis family lived not far away on the corner of Kemp and Collins streets, now a service vehicle laneway next to the multi-storey carpark. It was once a picturesque setting with an oak trees growing next to the laneway. In 1926, Curzona Frances Louise (Lily) Allport captured this in her linocuts ‘The house with Green Shutters’ and Kemp St..
Lewis’s advertisement in the Colonial Times named his eldest sons, David and Neil, as partners in the business; Bock was commissioned to paint the portraits of all the Lewis sons. 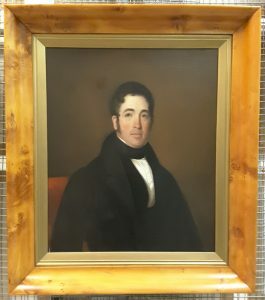 Neil Lewis, his father’s business partner, had only one eye – but you wouldn’t know it from Bock’s portrait, as the opposite side of Neil’s face is towards the viewer. George Lewis (also known as ‘Shanghai Lewis’) drowned in 1852 in a pleasure boating accident in China. 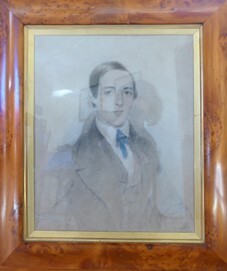 The youngest son was Charles, and there are several copies of his portrait in the collection. Tragically, he also died young – of scarlet fever at the age of 24. Perhaps this explains why there were several copies of his portrait – remembrances made for family members of the much-loved youngest son. The Lewis Family collection gives an insight into a large and successful colonial family. 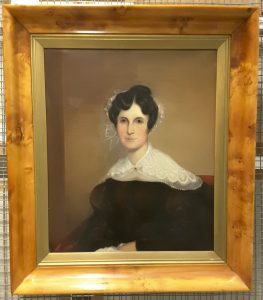 It depicts the founding Lewis family members from their youth to their old age, all via fine examples of Thomas Bock’s work in different mediums. The Allport is pleased to have acquired this collection as an important snapshot of our shared history. Was one of the daughters, Elizabeth Isabel Lewis Burbury?